What a night for a hockey game in Whitby! 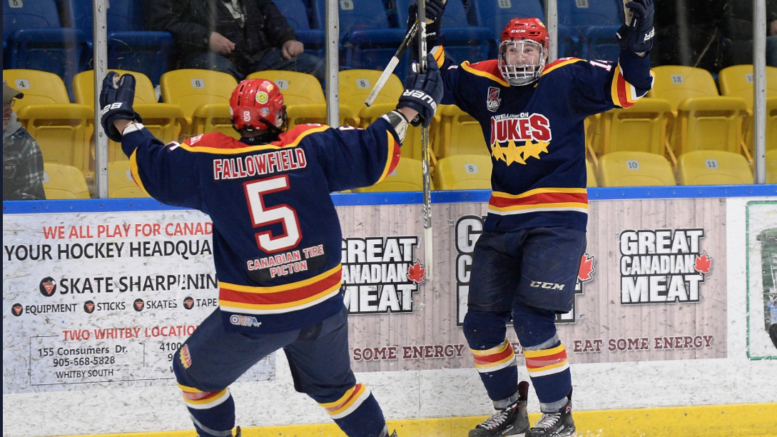 The Wellington Dukes, with their post season hopes on the line, came all the way back against the host Whitby Fury in Game 7 of the 2019 Ontario Junior Hockey League East Division finals in dramatic fashion, winning the series’ ultimate game 5-4 thanks to a late Quinn Hanna goal. 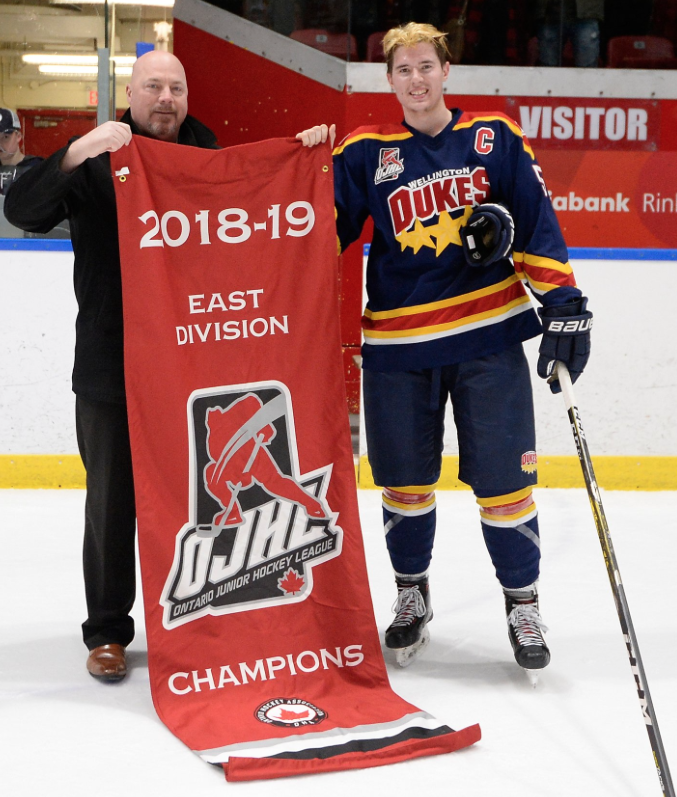 Once down 3-1 in the series and down 2-0 after one period of play in Tuesday night’s back and forth affair, these Wellington Dukes refused to quit and are every part deserving of the 2019 East Division banner that was presented to team captain Tim Fallowfield post game. Tuesday’s comeback effort marked the second time in two post seasons that Wellington had escaped the second round of the Buckland Cup playoffs after falling behind 3-1. The Dukes did the same trick to the Newmarket Hurricanes in the previous post season but Wellington head coach John Druce said the latest comeback that adds another chapter to the starry reputation of the hockey club is different than in 2018. It was a wild contest from the second frame onwards as Wellington exploded for three goals in a little under four minutes in the middle part of the stanza. Down 2-0, Elijah Gonsalves would convert a Tyson Gilmour feed at 6:03 and that dynamic duo was just getting started. Just over three minutes later, Kennan Eddy would streak to the Whitby net and fire the puck past Luke Pearson to get the Dukes back into the contest at 2-2. Just as Wellington was starting to gain traction however, a turnover deep in the Dukes zone would allow Noah Dollo to find Dakota Betts alone in front of Logan Bateman and the Fury were able to restore a Whitby lead. Gonsalves was johnny-on-the-spot moments after the Betts goal to deposit his second of the period over Pearson and it was 3-3. The game took another turn later in the frame as Andrew Rinaldi’s effort from the lip of the crease was washed out and the Wellington speedster was handed a two minute goaltender interference minor. Betts would wind up bagging his second of the second frame to put the Fury ahead 4-3 heading into the second intermission. The defending Buckland Cup champions would need some soul searching in their dressing room during the break and a successful and gutty penalty kill of the top of the period help ease Wellington’s frazzeled nerves. Finally, the Dukes would inch closer as Gonsalves would find Gilmour at the 8:23 mark of the third to make it a 4-4 game. Both teams had glorious chances to forge ahead in the late going with Pearson foiling Rinaldi from in tight and Betts ringing the post behind Bateman. That’s not to say the Ottawa, ON native was all luck in the Wellington cage as there was at least one puck check stop and another toe save on a two-foot tap in that kept the hosts at four goals. With overtime looming, it was the series’ best all around player that had a say in its outcome. With just 46 seconds left, Hanna took a loose puck off the boards, skated to the high slot and ripped a top shelf effort over Pearson, popping the water bottle of the Whitby net. It was Wellington’s first lead of the game and the first time they led the series since the end of Game 1. Whitby would yank Pearson for an extra attacker but some nice defensive zone work by the Dukes ensured the visitors would emerge victorious in front of a legion of Wellington faithful that made the trek to the Iroquois Sports Complex. Druce would shake hands with Whitby coach Rob Pearson and share a moment with his fellow NHL alumnus. “(Pearson)’s done an amazing job for that organization and they are one of the toughest opponents in the Conference. When ever we played them this season, it was one of our toughest games and we always knew we were in for a battle right from the start. I told him I was really impressed with what he’s been able to do in this league in two seasons,” Druce added. Wellington will now take on the North York Rangers who are led in goal by Prince Edward County native Jett Alexander. Details on the schedule for the 2019 OJHL Northeastern Conference finals will be released in the coming days.